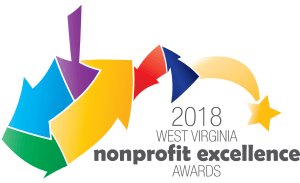 The West Virginia Nonprofit Association’s Awards for Excellence are designed to recognize the outstanding accomplishments of West Virginia Nonprofit organizations and increase awareness of the impact of the nonprofit sector in communities throughout the state of West Virginia. The foundation for the Awards for Excellence are West Virginia’s Principles and Practices for Nonprofit Excellence. Read on to learn more. Scroll down to nominate your organization. Created by the WVNPA, the awards are open to any 501(c)3 nonprofit organization located in West Virginia. There is no fee to apply for the award. Organizations do not have to be a member of the WVNPA to apply. Applications are welcome from small, medium, and large nonprofits as well as new or well-established organizations. Organizations can self-nominate or be nominated by someone else. Awards are based on the organization as a whole and not on one specific program. Nonprofits are encouraged to re-apply the following year if not chosen. Past award recipients are not eligible to apply for 3 years. Winners will receive an award, be recognized at WVNPA’s Nonprofit Leadership Summit at Canaan Valley Resort, September 25, 2018, on WVNPA’s website and in a statewide press release, and receive one free registration to the annual Summit. Applications must be received by July 31, 2018. Winners will be selected and notified by August 17, 2018. The award selection committee is an all-volunteer committee selected by the WVNPA’s Program Committee. All information submitted remains confidential. If you are a winner, you must be able to send at least one representative to the annual conference Sept. 25 & 26. Contact the WVNPA at 304-667-2248 or email lauralee@wvnpa.org.